President Barack Obama will tell world leaders the United States "will never retreat from the world" at the UN General Assembly. President Barack Obama will tell world leaders the United States "will never retreat from the world" when he speaks at the UN General Assembly, the White House said on Monday, UPI reported. Spokesman Jay Carney told reporters Obama will offer context to the international situation and put forward a vision of U.S. leadership. “He will also send a clear message that the United States will never retreat from the world,” Carney said, according to UPI. "The United States will bring justice to those who harm Americans and the United States will stand strongly for our democratic values abroad." Carney said he expected Obama to address the recent unrest in the Muslim world over a U.S.-made anti-Islam video, and "the broader context of democratic transitions in the Arab world." 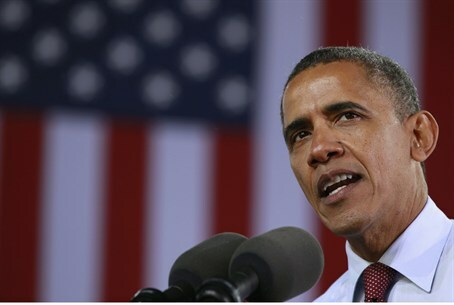 Obama’s speech will also address Iran, Carney emphasized. Obama will speak Tuesday at the opening of the 67th session of the UN General Assembly. "It's a real moment for the United States to assert its values and its leadership role to make clear where we stand in the midst of this remarkable period of transformation in the Arab world," said Carney, "[and] how U.S. leadership, combined with the leadership of other nations, is helping the peoples of that region overcome decades of tyranny and move towards democratic forms of government that are more responsive to their aspirations, that respect the rights of women and minorities." Carney said no sideline bilateral meetings were scheduled. Also scheduled to speak at the General Assembly is Iranian President Mahmoud Ahmadinejad, who will deliver his annual speech on Wednesday, which coincides with the Yom Kippur holiday. In the past, he has used the podium of the United Nations to launch a tirade against Israel, which Iran calls the “Zionist regime,” and the United States. On Monday, Ahmadinejad took the podium at a United Nations session on international law, causing Israel’s Ambassador to the United Nations Ron Prosor to storm out of the room.